BioNova™ is a network of landscape professionals, contractors, and pool builders who work synergistically to promote the state-of-the-art of Natural Swimming Pool (NSP) design, construction, aesthetics, maintenance, and environmental sustainability. From its North American Headquarters in New Jersey, BioNova™ Natural Pools supports licensed Dealers across North America and works with design professionals (e.g., landscape architects, landscape designers, and architects) on planning and implementing NSPs in a variety of settings. We work closely with our Clients to understand their goals and desires, we provide design drawings and construction plans, and our licensed BioNova™ Dealers are the artisans who produce the right end product, on time and on budget. All BioNova™ NSPs are constructed by licensed Dealers. Sharing information about Natural Swimming Pools and educating our Clients is at the heart of the BioNova™ mission. We utilize an Integrated Planning Process: a clear, proven approach based on detailed research and sound decision making. Our use of the internet and virtual meeting software allows for instant face-to-face communication between Dealers and Clients all over the world. BioNova™ Dealers are provided with world class training to ensure proficiency in design, planning, construction, and maintenance of NSPs. Multiple training sessions are held annually in both Europe and North America. To find your local BioNova™ Dealer, please click here. Please click here to view our gallery of residential Natural Swimming Pools, and feel free to contact us to discuss your project! (above) A BioNova™ Global Training Session. 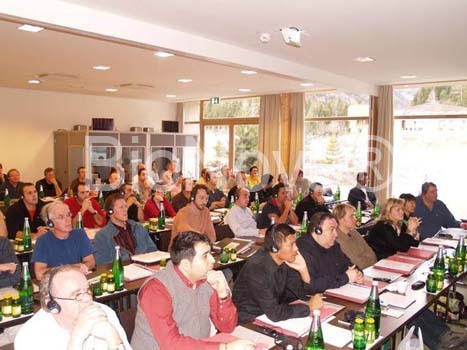 Dealers from the USA, Canada, Germany, Austria, France, Italy, Belgium, Australia, South Africa, Sweden, Switzerland, Luxembourg, Turkey, the United Kingdom, Poland, the Czech Republic, the Ukraine, Serbia, Romania, Mauritius, Israel and more, regularly attend training sessions. Headsets are worn for simultaneous translation when sessions are given in different languages.